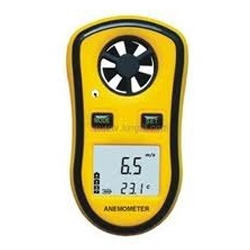 The portable anemometer provides fast, accurate readings, with digital readability and the convenience of a remote sensor. Multi-functiona for air flow measurement: m/s, km/h, ft/min, knots. Low-friction ball-bearing design allows free vane movement in accuracy at both high & low velocities. Sampling Time: Approx. 1 second. Multi-functions for air flow measurement: m/s, km/h, ft/min, knots. 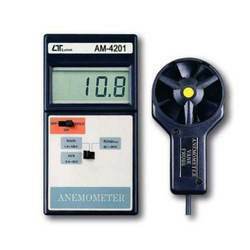 14mm (.5") 4 digit Large LCD Backlit display can measure Air velocity Air flow, Beaufort scale (Force) Direction from the North & Temperature, Dala Hold, Data memory and APO Function with Air Velocity / Flow Sensor 3 cup type and direction sensor low friction probe, AVM06A is compatible to PC interface connectivity.